Note: the architecture (of atmospheres) could become atomized into fine particles that aggregate in different manners along time, following different "rules" (these "rules" being the ones to be designed by the architect). 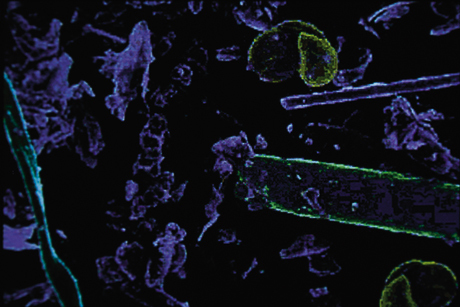 While we digg into sensors than monitor elements of the atmosphere (physical and non physical elements), we're definitely looking for a kind of architecture that would "deal" with these elements/particles and recompose them. In the history of architecture and design there have only been a few "effects"—electric light, forced air—that have had the capacity to cause massive environmental and behavioral shifts. Last year at Barcelona's annual design fair, the Catalonian designer Marti Guixe presented another—breathable food. "Pharma-food, a system of nourishment by breathing," is an appliance that was developed by Guixe to explore the transformation of food into pure information. Dust Food Muesli. Photos: Inga Knölke. Pharma-food joins the work of other, primarily European, designers who are exploring alternative regimens for such activities as washing or eating. One of Guixe's Catalonian contemporaries, Ana Mir, is exploring a technology that allows one to wash without water. Like Guixe's approach, this project would allow washing to occur anywhere. In their work, these designers not only free regimens from their fixed location in relation to certain products; they also free these activities from their traditional engagement with the body. Unlike designers such as Philippe Starck or Richard Sapper, who strive to revise traditional technologies, Guixe has discovered that the problem of eating does not involve the design of a new type of stove, sink, or refrigerator—the problem of eating requires finding a new mouth. Guixe, who has been studying alternative forms of eating for several years, realized that the breathing of "food" already occurs via the inhalation of dust that hangs in the air at work and at home. Guixe hypothesized that this form of eating, from which one gains a miniscule amount of minerals and vitamins, could be trans-formed into a more potent meal, a "dust-muesli," that would supply a powerful dose of nutrients. The Pharma-Food appliance, which sprays this ærosolized nutrition, connects to a computer and requires Microsoft Excel to enter exact values for such things as riboflavin, vitamin C, and protein. The combination of these nutrients are saved on the computer as documents with names such as "SPAMT," which has the nutrient "language" of tomatoes and bread, and "Costa Brova," a "seafood" dish that is heavy on the iodine and light on carbohydrates. Guixe imagines diners composing these "meals" and sending them as e-mail attachments to other owners of the Pharma-food emitter. "Like MP3," says Guixe. While Guixe has explored the experience of eating this information, less explored and of equal significance is where this type of eating can now take place. Guixe imagines Pharma-food in a special "Pharma-bar," essentially a simple room with tables and chairs and several emitters. But why is this necessary when he has liberated food from kitchens and from forms of ingestion that require utensils and dishes? Pharma-food will allow eating to occur anywhere at any time; on subways, in cars, in our beds, while exercising, sleeping, or making love. Most interesting is what effect this device will have on the home, particularly the American home, which is dominated by the kitchen. While technologies are given free range at work and in other public spheres, the home is typically the place where devices such as Pharma-food are tamed and held in balance by a previous technology that the new device is meant to replace. Central heat did not eliminate the fireplace; it allowed this formerly grimy, soot-filled artifact to become an æsthetic symbol and heart of the American home. People began using fireplaces less, but when they did, they burned wood in them again instead of coal. Similarly, cooking the monthly meal may involve stoking a wood-fueled, cast-iron stove while simultaneously breathing a few appetizers with friends. David Gissen is associate curator for architecture and design at the National Building Museum in Washington, D.C. He is currently developing an exhibition on human conveyance (elevators, escalators and moving sidewalks) and one on flying buildings. 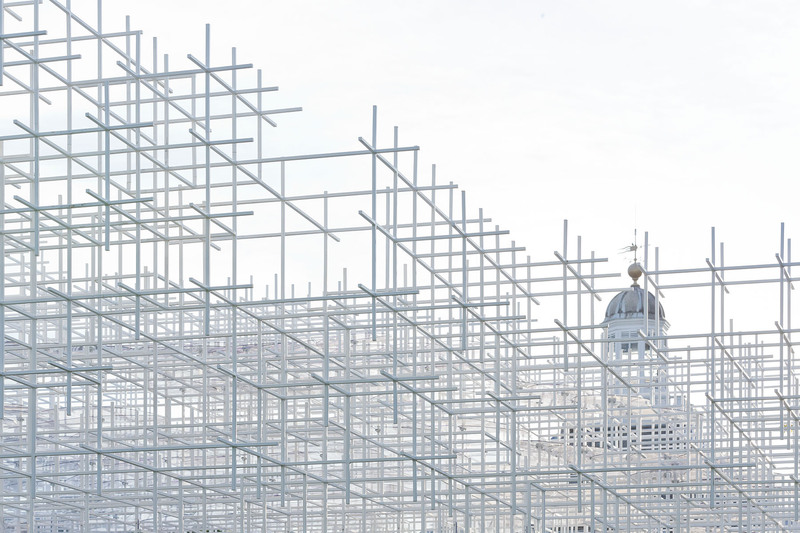 Rather than a mere folly, Sou Fujimoto's Serpentine Pavilion is sincere in his proposition about the future of architecture and its place in the world. 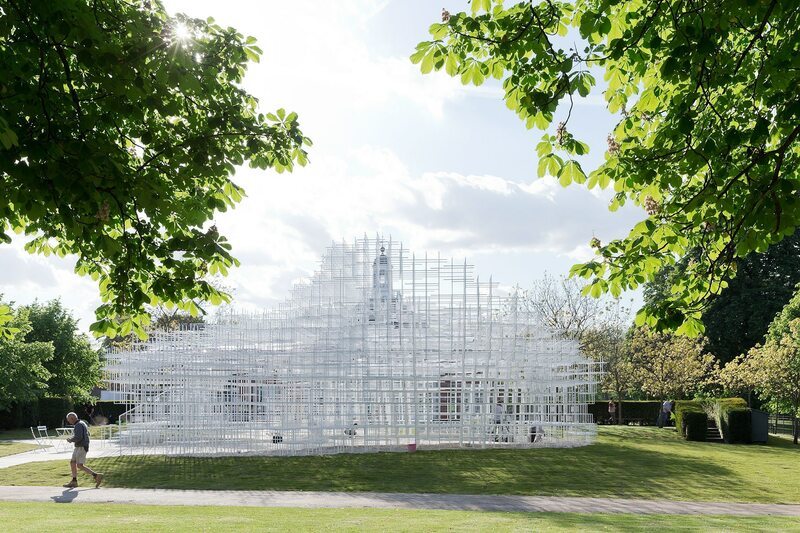 If Vivaldi’s Summer is the architectural high-season, then the Serpentine Gallery Pavilion is its opening refrain — a measured, majestic transition from the long British winter to the frenetic hyperactivity and crystalline skies of summer proper. Perhaps for this reason the Pavilion always attracts a certain sleepy journalism, as though the whole press hadn’t yet had their morning coffee. One reads endless tales recounted as though written in a half-waking state — soggy with dream-like odes and fanciful metaphors, rambling and extravagant, but almost universally uncritical. On the rare occasion that a pavilion does get bad press, it is invariably childish insults hurled at the architect with a kind of impertinent bad-temperedness: “Nouvel resembles an ageing bouncer,” (Edwin Heathcote, FT) “I smell Jean Nouvel before I see him,” (Tom Dykhoff, The Times) “A one idea building from a once extraordinary architect” (Ellis Woodman, The Telegraph). In fact, although Nouvel’s 2010 shape-shifting red pavilion was received terribly, it remains the only attempt to broaden public engagement beyond the over-priced Fortnum & Mason’s coffee bar. With free kite flying, table tennis, chess and checkers, it became for a short period the only building in all of Knightsbridge that didn’t force you to spend money to enjoy its amenities. 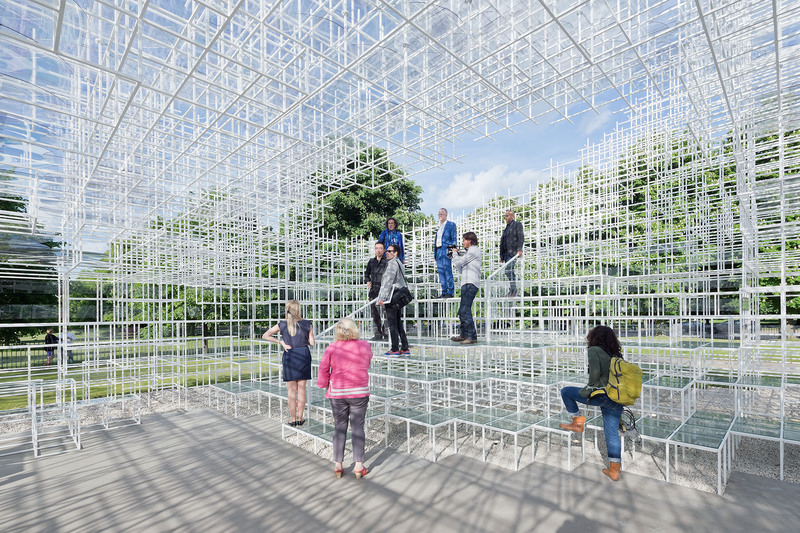 More importantly, critique of the Serpentine Pavilion as an institutional project is totally absent. Inasmuch as the media accept or reject this or that form, it amounts to whim. We must name the Serpentine Pavilion for what it is: a star factory whose elitist self-perpetuation typifies the vapid iconicity of the pre-Crash years. This is a massive work of architectural branding, or at best, architecture-as-sculpture. At the core of the whole project is a profound question about the intended benefactor of all these pavilions. For architects, the project’s ambition of providing a platform for little-known practitioners operates like a last-chance saloon for the already established. The category of never having built in the UK only increases the uniqueness of the bijou. For visitors, the pavilions do not serve any obvious purpose beyond to be looked at. Yet most passers-by do not actually spend much time looking at all (about four to six minutes). Presumably many are put off by spaces always focussed around a hopelessly over-staffed bar of well-dressed waiters, patiently expecting you to buy a £3 Americano. The only entity that really profits from the pavilions is of course the gallery itself. Beyond the empty rhetoric, it is publicity for the sake of publicity. 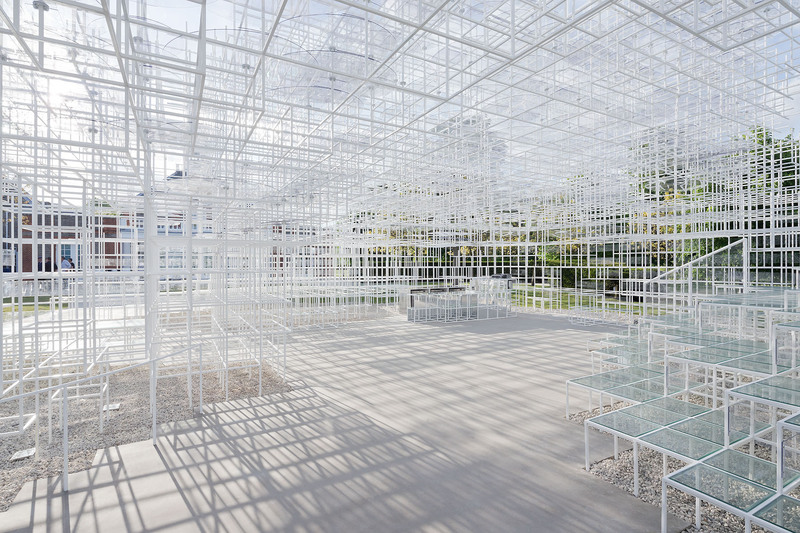 All this is unfortunate really, because Sou Fujimoto’s nebulous pavilion is possibly the finest yet. Rather than a mere folly, Fujimoto is sincere in his proposition about the future of architecture and its place in the world. A polite, quiet, deferential man, he speaks slowly, but explains himself with eloquence and a precise clarity. I quickly notice a pattern in the way he responds to questions: first a tactful and positive remark, then his opinion. For an outsider, Japan’s complex social order can be at times impenetrable. Certainly though, something that has always struck me is the traditional continuity between generations of architects — where in the West each younger generation has to forcefully overthrow, reject (even denounce) their elders, the Japanese seem harmonious and respectful. On the contrary, Kengo Kuma told me recently that just because he goes for Sake and Karaoke with Ito and Sejima (his words), it doesn’t mean he won’t take advantage of any opportunity to distinguish himself and declare his independence. As the youngest Japanese architect to do a pavilion, how did Fujimoto relate to this type of culture, with respect to Ito and SANAA? As you manoeuvre around the pavilion the form changes quite radically, and in a sense it is quite hard to say what shape it is. 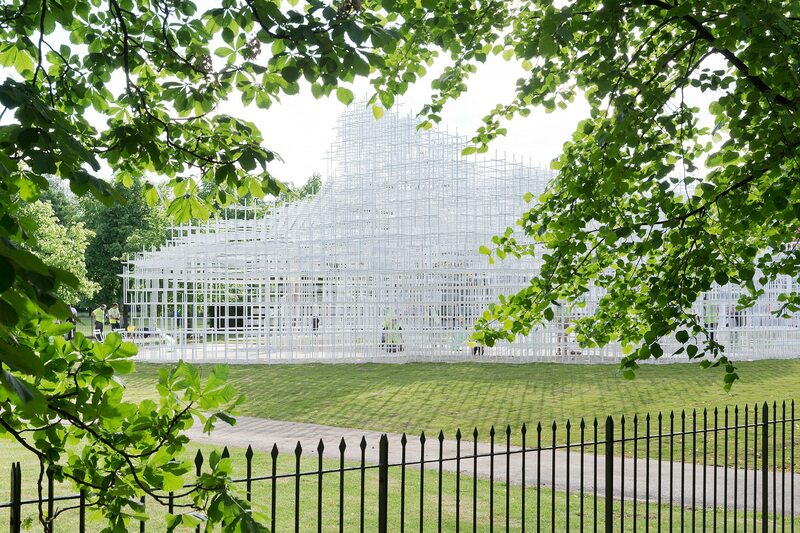 Normally, the architectural press (and Serpentine Gallery) don’t like shapeless pavilions, as though each building must be reducible to its own 32-pixel icon. 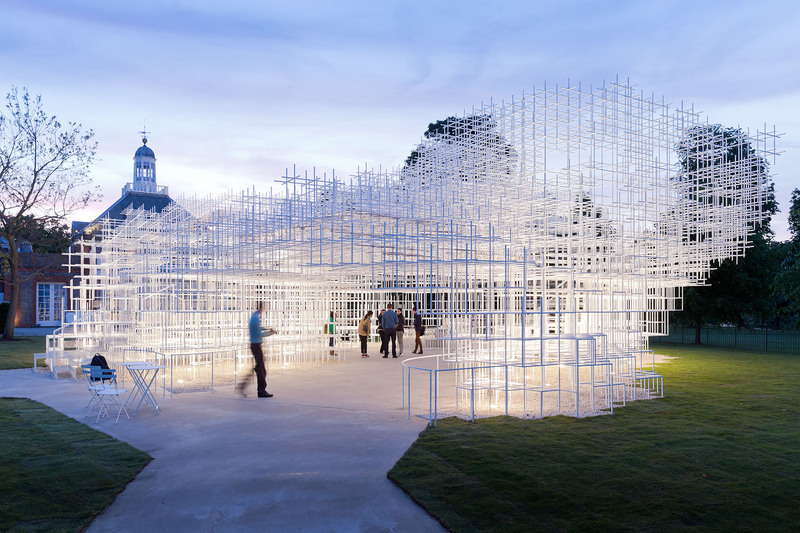 Unlike Nouvel, the response to Fujimoto has been overwhelmingly positive, which led me to think there might be different kinds of formlessness. In late 2009, researchers at the Mayo Clinic in Rochester, Minnesota, validated some horrifying claims: 24 slaughterhouse workers from two states had reported symptoms ranging from numbness to paralysis. What all the claims had in common was the workers' location at or near the “head table” in pork processing plants where pig heads are butchered. Investigations revealed that the workers had inhaled a mist of pig brains, and that this had in turn triggered an auto-immune response, causing neurological disorders. This was not only disgusting; it was also a surprise to scientists to learn that “aerosolized” pig brains, the microscopic industrial byproduct of mechanically blowing out every last piece of flesh from a pig's head, can impair the motor functions of anyone who breathes them in. Perhaps it shouldn't have been a surprise. Almost a century ago, the air we breathe was first understood to be, potentially, a weapon — an innovation that was, like so many innovations, born in warfare, and which marked a turning point for the modern mind. So argues German philosopher Peter Sloterdijk in Terror from the Air, his exploration of the rise of environmental warfare, starting with the German army's deployment of chlorine gas against French and Canadian soldiers at the battle of Ypres in 1915. With the invention of poison gas, the air itself — the imperceptible atmosphere that surrounds us — could be activated, differentiated and unleashed as a killer — as a kind of anti-air. It could be weaponized, and as such used against civilian as well as military populations, a latent concern that became newly pressing in the post-Sept. 11 autumn of 2001 when somebody, most likely a scientist in an American army lab, sent packets of anthrax spores though the U.S. mail, killing five people and infecting seventeen others who breathed in the dust that became airborne when they opened the envelopes. As architecture theorist Enrique Ramírez has noted, on his site, aggregat456.com, all airborne attacks — he traces a line from the U.S Army's Chemical Warfare Service in Japan during World War II to the 1995 sarin gas attack on the Tokyo subway, attributed to the Aum Shinrikyo cult — take malign advantage of the diffusing properties of the air, and of the workings of our pulmonary systems, which deliver the oxygen our bodies need to live. Indeed, the history of weaponized air is long and sometimes macabre. For the past couple of decades — to cite just one more example — the U.S. military has been contaminating otherwise safely breathable air by shooting uranium-tipped bullets. When fired, the bullets become extremely hot, which enables them to pierce armored tanks. Such bullets have been used on battlefields from Kosovo to Baghdad, and also on bases such as the former practice range at Vieques, Puerto Rico. They leave a barely detectable plume in their wake, polluting the air and exposing local civilians to the dangers of radioactivity. Nerea Calvillo, In the Air, 2008. Aerosolized pig brains and various forms of weaponized air suggest we have underestimated the presence of air, and what it can potentially do. Whatever the spur, we need to take seriously the materiality of air. And today, in fact, a growing number of artists and architects are engaging air in new ways. They are exploring air as a design component, studying how airborne particles can be manipulated into various textures, surfaces and spaces. They are transforming the scales at which architects typically work. And they are bringing the multiple temporalities of air into play through designs that actually collect and archive air from different times. This work could bring about a new consciousness and perhaps an expanded understanding of the meaning of a public architecture — an effort to reclaim the air from those who've attempted to control it in irresponsible and dangerous ways. There are, of course, potential hazards with this sort of visualization. It might become confusing, a mass of undecipherable information that a viewer can’t easily sort through. It might also become merely an aesthetic spectacle — a razzle-dazzle data performance sans political meaning or artistic depth. And no matter the goals of the designers, information that unexpectedly becomes visible can be politically suspect — unclear in its motives and methods. Its persuasive capabilities can be elusive as well as treacherous. But Calvillo hopes to empower public health activists who seek to verify or disprove air quality claims made by interests ranging from the state to corporations. Top: Nerea Calvillo, In the Air. 2008. Bottom: Diller + Scofidio, Blur pavilion, 2002. 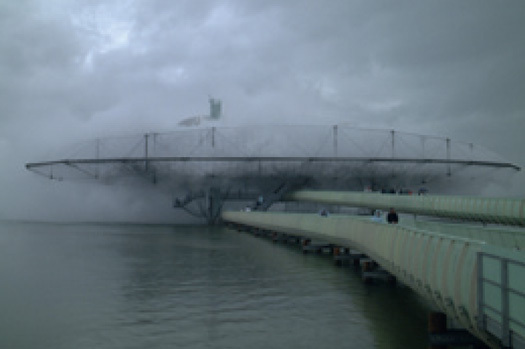 When viewed formally, as architectural spaces of uncertain shape, Calvillo's clouds are part of a contemporary trend, and bring to mind other architectural experiments, most famously the Blur Building, created by Diller Scofidio + Renfro for the Swiss Expo 2002. 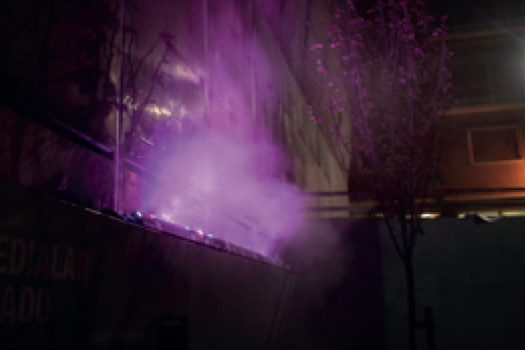 That project, an "architecture of atmosphere," in the designers' term, challenged the materiality and permanence of conventional construction, using a misting-nozzle "smart weather" system that responded to changing atmospheric conditions. 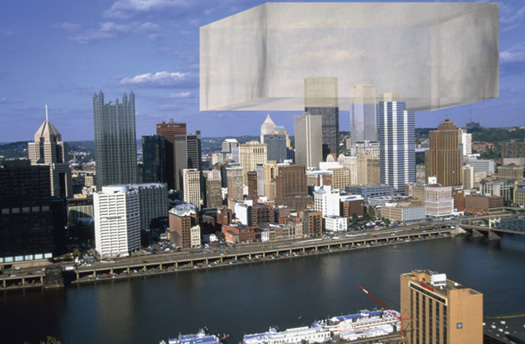 Although, like most expo projects, the Blur was a temporary structure, it worked largely in the tradition of the architecture project of a certain scale, and its atmospheric element — its blur — is conceived and experienced as a monolithic unit, in contrast to the “invisible layers” of Calvillo's In the Air. Another building conceptualized as a response to its atmospheric environment is the B_mu, a museum project in Bangkok, by the Paris-based architecture practice R&Sie(n). Never built, the radical project, which has achieved a kind of cult status, consists of a stack of rectilinear gallery spaces wrapped in a drooping shroud coated with an electromagnetic material that would attract particles from the polluted city air, much the way the screen of a computer monitor attracts dust. 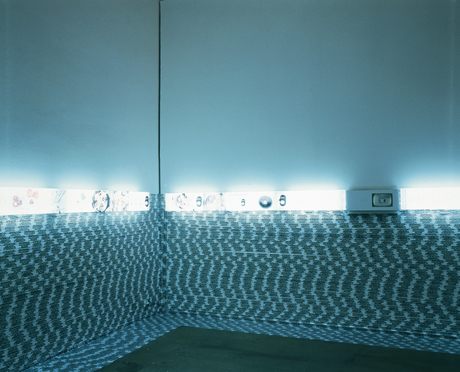 The project drew inspiration from Man Ray’s 1920 Dust Breeding (Duchamp’s Large Glass with Dust Notes), a long-exposure photograph of dust collecting on Duchamp's The Large Glass. As envisioned by the architects, the museum would, with time, become fuzzy and sooty. In this sense R&Sie(n) wanted to harvest the air itself. Yet much like the Blur Building, the project remains conventional in program, organization and scale — and even the social meaning of the pollution itself remains unclear and thus unchallenged. Cocooned in the climate-controlled museum, visitors would have been literally protected — and politically distanced — from the complex networks of relations that enabled the pollution in the first place. Given the social provocations of In the Air, even recent projects like Blur and B_mu seem increasingly to belong to an early generation of air design that replicated customary scales of architectural work. 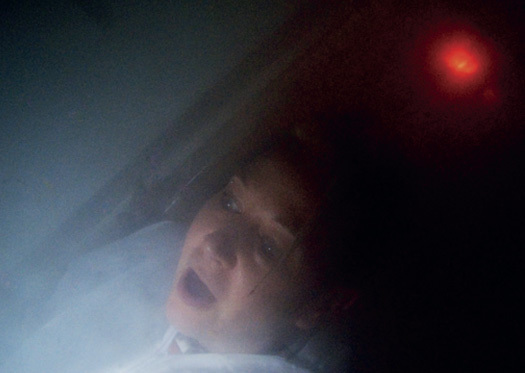 Calvillo’s work opens up something new, something that might eventually allow users to “make” new atmospheres based on diverse personal or group agendas. Her sights are set on transforming the smallest pieces of architectural form, what she calls "the microscopic agents that are with us" — spaces that we are often unaware of, but which are everywhere. David Gissen, Reconstruction: Smoke. 2006–2010. Another experimentalist historian, the architect Jorge Otero-Pailos, is focusing on historical preservation at a smaller, more domestic scale. Along these lines, he has proposed recreating the smells of cologne and tobacco that once filled the air of the now landmarked Glass House, by Philip Johnson, in New Canaan, Connecticut. Here too, the idea is to make us think about the atmosphere of the place when it was a salon crowded with architects and artists — and smokers — like Mies van der Rohe and Andy Warhol, cluttered with ashtrays and hazy with smoke. Bompas & Parr, Alcoholic Architecture. 2009. The designers of In the Air, on their detailed website, imagine a future when we might all participate in atmospheric creation: "A domestic version of the prototype will be developed. Assembly instructions will be posted on the web and each user will be able to make a unit for their balconies or windows. This will generate a distributed net of visualizations, representing the data collected throughout the city. An individual can “tune” their unit to select the pollutant they are interested in tracking — this will allow for the construction of a collective map of personal environmental interests." These days we read many claims and assertions about ecology and clean air. What if, as In the Air suggests, we could suspend a plume of tinted air created from years-old data and evaluate it next to a plume created from current data? Has the air improved, or not? 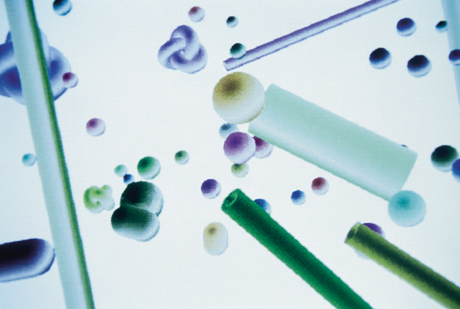 Is the particle density greater or lesser? Using In the Air's instruction manual, perhaps one could sift out the air made by a certain polluter, and even re-situate it or blow it into a different location — perhaps toward the polluter’s corporate offices. One could colorize the pollutants that hover over a landscape we are forbidden to enter, like the base at Vieques, with its uranium cloud, so that local residents could identify it from afar. (The base has been demobilized as a “wilderness refuge” — a U.S. government tactic for avoiding the remediation entailed by Superfund designation.) These actions could take air into the realm of political contestation, activating streets and public spaces. But all of this will only be possible when we no longer perceive air as monolithic, singular and static. In Subnature, Gissen notes that architectural theory and history offer fleeting glimpses of the problem of vapors and dirty air, usually in discussions of chimneys, vents, and other building technologies meant to exhaust smoke from spaces while at the same time retaining the heat and the social pleasure of a hearth fire. Smoke or pollution that contaminates homes, workplaces or entire cities has sometimes signified urban dysfunction or lack of progress, or conversely, modernity and industrialization. Today we are exploring ever more technologically advanced techniques for carbon capture and sequestering, and for using toxic residue like fly ash to make concrete for roads and buildings. Certainly these techniques serve to minimize harmful emissions; they also perhaps reinforce our tendency toward "out of sight, out of mind." In comparison, the projects envisioned by Calvillo, Gissen, Otero-Pailos and others have the opposite aim: to make bad or questionable air visible, part of our perceptible experience, and in this way to make it a real part of our political discussion.